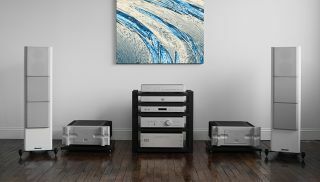 Bryston unveils new flagship Active loudspeakers | What Hi-Fi? Included in the line up are the Model T Active, the (smaller) Middle T Active (pictured) and the (smaller still) Mini T Active. Bryston has a new range of loudspeakers on the way for 2018. It's the company's 'Active Loudspeaker' lineup, and it's three-strong. The Model T Active is a 133cm tall floorstanding loudspeaker, fitted with three 20cm woofers, two 13cm midrange drivers and a pair of 2.5cm tweeters. The smaller Middle T Active follows the same design philosophy, but is only one meter tall. It has two woofers, a single midrange driver and single tweeter - all the same size as those in the Model T Active. Similarly, the Mini T features a woofer, midrange driver and a tweeter each - which is probably only sensible in a smaller, standmounting speaker. The speakers are connected to Bryston's DSP-enabled active crossover (BAX-1) and Cubed Series Bryston amplifiers. In contrast to passive speakers, an active crossover takes the signal at the preamplifier level, giving you greater precision over the filtering of the frequency ranges. In this case, the amplifiers are just separate from the speaker, as you can see in the photo, rather than built into them. Bryston says this is because it utilises "full-size, zero-compromise outboard amplifiers [...] to deliver best performance." Bryson has made two new amplifier modules for these speakers: the three-channel 21B³ and six-channel 24B³. Two 21B³ amplifiers are recommended to drive a pair of Model T Active loudspeakers, while a single 24B³ amp has been deemed suitable for the Middle T Active and Mini T Active systems. The Model T Active system will be priced at $33,770 (approximately £25,000) and will be available in the early part this year. The Middle T and the Mini T speakers are priced at $20,230 (approximately £15,000) and $17,690 (approximately £13,000) respectively, and will be available around the middle of the year. All of the loudspeakers are available in 'Black Ash', 'Natural Cherry' and 'Boston Cherry' colours.